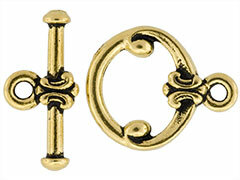 These Antique Gold TierraCast® toggle clasps are pewter cast, lead-free and made in the USA. These clasps are plated with precious metals and high-quality base metals and make beautiful closures for bracelets and necklaces. These finely crafted TierraCast® toggle clasps come in a wide variety of finishes and will become integral parts of your finished pieces. This product was added to our catalog on Wednesday November 29, 2006. I've been using these clasps for years and just wouldn't use ..